Rainbow Runners, also known as Hawaiian Salmon, Spanish Jack, and Rainbow Yellowtail, are a relatively common member of the Jack family. 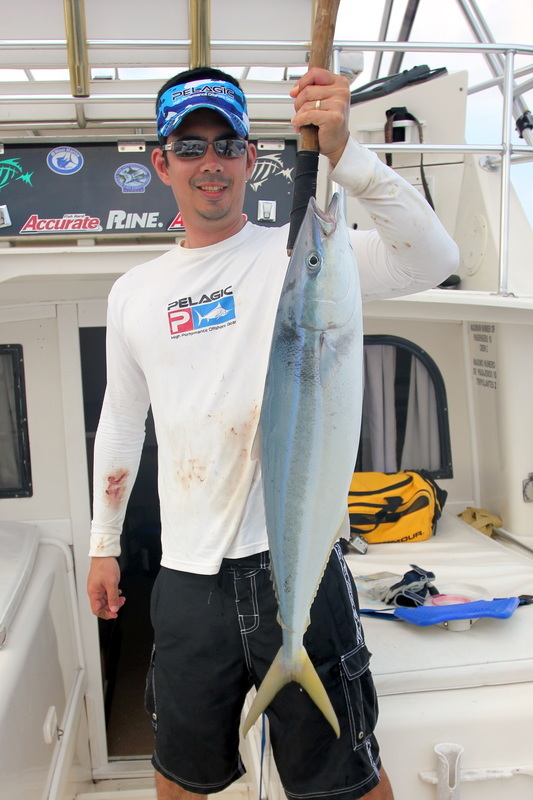 Like all Jacks, they are strong and put up a good fight but being more slender than most Jacks they are not as tough as their broader cousins like the Giant Trevally or even their closer relative the California Yellowtail. Their diet consists primarily of small fish and squid. Rainbow Runners are widespread throughout the tropics but are rarely specifically targeted. They are usually bycatch when fishing for other species offshore. Some people do target them when fishing with poppers, which they will eagerly take. Rainbow Runners can make excellent baits for very large fish such as Marlin and Tuna. They max out at around 40bs. The one in the photo above is fairly typical of the size of the ones I have caught and seen. Like all members of the Jack family they pull very hard for their size. Unlike many members of the Jack family, they are decent to eat but not highly prized. They are often caught as bycatch by commercial shark and tuna fishermen and sold for food. These are a blast to catch on poppers so a medium heavy spinning outfit is a good choice. 30lb braid is sufficient although most people will be using heavier tackle in case a larger species bites. You don't have to worry about using wire since these do not have sharp teeth. Click here for tackle recommendations. Rainbow Runner respond to a wide variety of techniques including poppers, trolling, live bait, and jigs. They are not that picky. Medium poppers like the 5-1/2" Yo-Zuri Sashimi Bull or Rapala Skitter Pop work well. They are also often caught while trolling various minnow plugs or skirts. Rainbow Runners will eagerly take live baits like small fish and squid. Any bait fish caught in the area they live should work. I'm not aware of any places that boast particularly large Rainbow Runners since most people don't target them but they are found throughout the tropics. Many large ones have been caught in Mexico. This Rainbow Runner was caught on a live baitfish in Mexico. 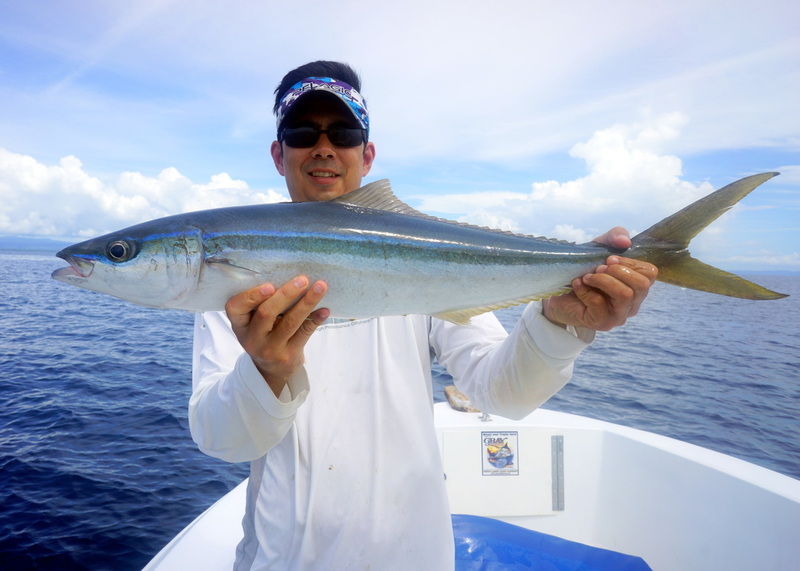 A Rainbow Runner that ate a Skitter Pop in Majuro Atoll, Republic of the Marshall Islands.